the status of Jamaican Patois: a “comparison” of a new New Testament with CUSS-CUSS by Louise Bennett-Coverley? Many … see the elevation of patois as a backward step for Jamaica, in a globalised world demanding English. The presumed “elevation of patois” that Pigott is reporting on is a new New Testament translation project. 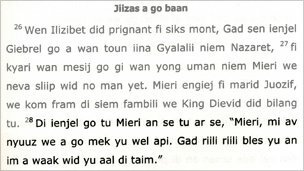 In his article “Jamaica’s patois Bible: The word of God in creole,” Pigott gets at the fears that Patois will replace not only English but also Patois-English bilingualism. The government is promoting use of English as a language of wider communication. A group of NT translating linguists at the University of the West Indies in Kingston is creating a phonetic writing system and grammar that might give the status of a legitimate language to the creole. What Pigott only hints at is that Patois already has status, that it already empowers its users, that it doesn’t necessarily threaten the use of English, that feminist-poet-educator Louise Bennett-Coverley started much. But in Pigott’s article, neither an English version of the Luke passage nor any written version of Bennett-Coverley’s poem “CUSS-CUSS” is provided. Please find these below. Ah wey yuh gwine goh do? Dem tink me fraid o’ yuh? Is me yuh want fe trace? An leggo pon yuh face. Gal noh badda get me out. Mule kean meck up him mine. An meck dem heng awn wrang. Koo pon yuh two nose-hole! Miss Tane outsize fish bowl. Wen yuh kean do a ting. Not to be confused with Kas-Kas, this poem re-stages a tracing match (i.e. a quarrel) between two Jamaican women. Common cuss-words like “boogooyagga” (low-grade) “heng-pon-nail ” (bedraggled) are here liberally used. Opponents are sometimes subjected to the most unexpected similes as ” Yuh lip dem heng dung lacka wen Mule kean meck up him mine”. Get away from here! you look like a vagabond! assume I’m afraid of you? Get out of here! You resemble clothes on a stick. ‘Tis me you really trying to disgrace? and let it fly into your face. and I pay no license to communicate. You better not get me irrate. like a mule that can’t make up his mind. Go away, you and I aren’t friends! and attached them quite wrong! and just look at those nose holes! just like Miss Tane’s oversized fish bowl. and yet you want a wedding ring?! When you can’t do a thing! but I definitely go to a good school. I’m so sorry for the man you get. and ‘illiterate’ his chicken wing. Is the new NT translation really “elevating” Patois by giving this language a wider use? Does the fact that students, particulary girls, in Jamaican schools know Louise Bennett-Coverley and her poetry by heart already give a status to Patois and an agency to these young people? Is the translation project a continuation of the sorts of language promotion and education and feminist efforts of Bennett-Coverley? Will there be the sort of embracing of the Patois New Testament as there was for this poet and her works? In 1974, she was appointed to the Order of Jamaica. On Jamaica’s Independence Day 2001, the Honorable Mrs. Louise Bennett-Coverley was appointed as a Member of the Jamaican Order of Merit for her invaluable and distinguished contribution to the development of the Arts and Culture. She wrote her poems in the language of the people known as Jamaican Patois or Creole, and helped to put this language on the map and to have it recognised as a language in its own right, thus influencing many poets to do similar things. The New Testament has been completed by a team of translators at the Bible Society in Kingston. They intend to publish it in time for the 50th anniversary of Jamaica’s independence from Britain on 6 August next year. Given this timing, what are the political implications? What other long term changes, intended or not, might the new NT in Patois bring? Has the BBC suggested that the Bible Society is doing for the first time some of the things that Bennett-Coverley is known for? Is Pigott’s comparison of the Patois NT verses with lines from “CUSS-CUSS” really an inadvertant contrast? What do you think? It is fascinating to see how different Caribbean countries view creole languages. I’ve never been to Jamaica. The Caribbean country I know best is Haiti; where Kreyol Ayisyen is widely accepted. Although French remains the official literary language of Haiti, there is a small Kreyol literature, including a translation of the Protestant Bible. It is simply not possible to get by in Haiti without knowing at least some Kreyol. Haiti’s official literacy rate is 54% (which sounds high to me — I believe that the real functional literacy rate is closer to 15%), the lowest in Western Hemisphere; and 85% of all college-educated Haitians live outside Haiti. As a bonus, knowing a bit of Kreyol is quite helpful when one goes to Miami, New York, Boston, or Montreal. As a Jamaican-American resident in New York, and a retired educator of students who are native speakers of languages (and dialects) other than English, I wholeheartedly endorse the current efforts of Robert Pigott to have the Bible translated in Jamaican (or, as some would name the language, Jamaican Creole) . For me, the name “Jamaican Patrois” has too many colonial baggages that, ironically, would continuously ‘weigh down’ the language rather than to elevate IT — the desired goal. Trained in linguistics (particularly psycholinguistics), I recognize the vast merits of preserving the language by having it rendered with a formal Creole orthography — as is the case with Haitian (or Haitian Creole) now used as a medium of instruction, along with English in New York State’s public schools. For those who are ‘reticent’ to have the Holy Bible translated in Jamaican, may I suggest a friendly reminder that English, or any other European or Asian language is not the original language of the Bible, but Hebrew and Aramaica — and later Greek and Latin, etc. Yet with all of these translations, the Holy message remains uncompromised. So indeed it will be with the Bible translated in Jamaican (Jamaican Creole). One other important observation: Elevating Jamaican to be a language with a formal standardized orthography in no way compromises the prestigious status of English. It only proudly demonstrates the island of Jamaica to be fully and formally bilingial: Good for business, good for education, good for national pride and culture! Karl — Thanks for your thoughts. I am sorry your comment was stuck for a while in our comment queue. Yes, thanks for your comment. Thanks also for emailing briefly. I’ve asked 8 or 9 questions at the end of my post. Two are key: Has the BBC [through Pigott’s sloppy and no-new news reporting] suggested that the Bible Society is doing for the first time some of the things that Bennett-Coverley is known for? Is Pigott’s [only implicit] comparison of the Patois NT verses with lines from “CUSS-CUSS” really an inadvertant contrast?